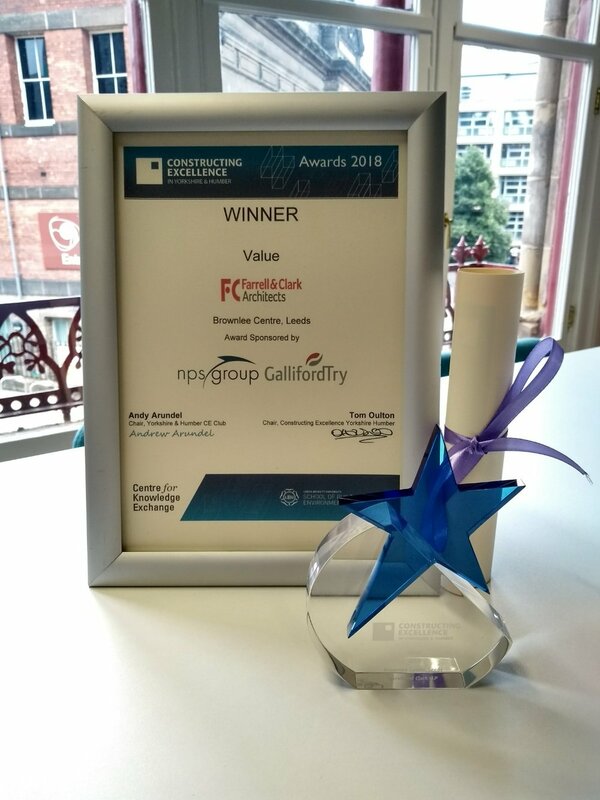 The Constructing Excellence Awards, Yorkshire, brought success in two categories for Farrell and Clark. Highly Commended in the Sustainability category was our Harrogate Civic Centre project, designed for Harrogate Borough Council. The winner of the Value category was The Brownlee Centre designed for the University of Leeds. The new facilities include a reception area specialist room for fish, invertebrate, nocturnals, reptiles and amphibians plus quarantine and isolation rooms. Rabbits, guinea pigs and small mammals all have their own indoor and outdoor areas. There is also a dedicated dog exercise area and grooming room, outdoor and indoor aviaries, outdoor runs for ducks, hens and geese and a wildlife area. The Brownlee Centre, designed by Farrell & Clark for the University of Leeds, won the LABC award for Best Educational Building. 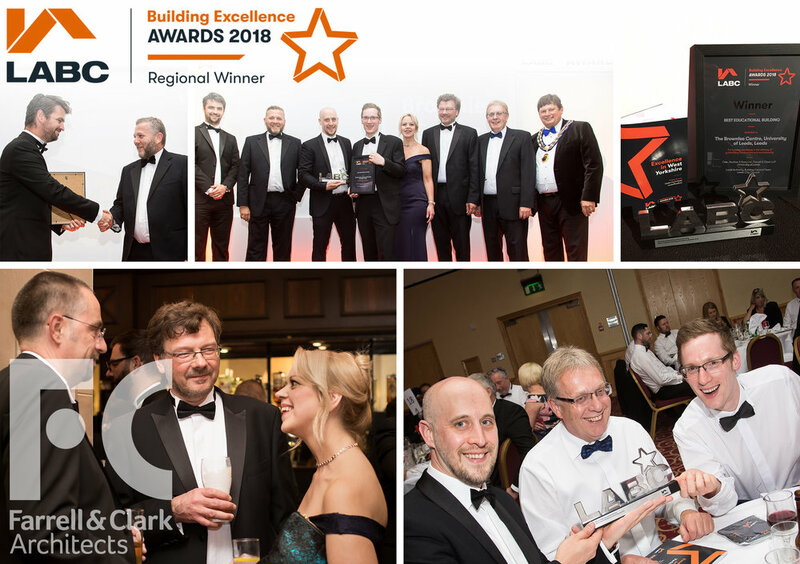 The awards celebrate achievements in the construction industry. They reward excellent buildings, outstanding companies, partnerships and individuals that go that extra mile. Completed last year the Centre, accommodates British Triathlon's training base for their elite athletes’ programme, as well providing changing and social facilities for the University of Leeds winter sports teams. In addition to the Centre, the site is also home to a 1.6km closed circuit cycle track, which British Cycling regularly host cycling taster sessions and competitions on. Farrell & Clark joined Leeds Society of Architects (LSA) and RIBA Yorkshire at the 2017 National Award Winning - Victoria Gate Arcade. Occupying two units, hosting an exhibition and a ‘Pop-Up’ studio, Farrell & Clark displayed their work alongside other Leeds based architectural practices. The ‘Pop-Up’ Studio provided workshop space for ‘Architects in the Arcade’ a programme which gave member of the public a chance to meet with a RIBA Chartered Architect for a free 30 minute design consultation. 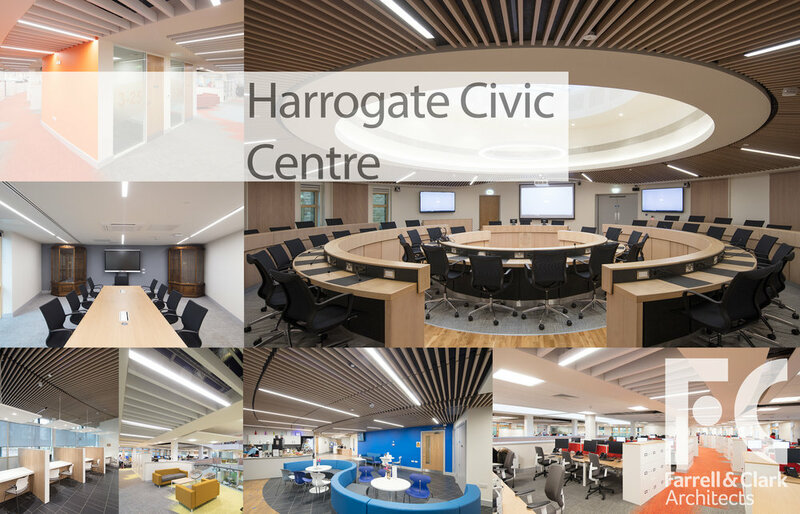 A new civic headquarters for Harrogate Borough Council, set into a steep site within a wooded conservation area. The building includes public services, council member’s facilities and flexible office space to facilitate agile working. Harrogate Borough Councils’ brief was to provide a single site for staff, councillors and the public facilitating a ‘One Council’ culture with reduced running costs and improved operational efficiency. An emphasis on construction quality aims to reduce overall operating cost by around £1 million. This new facility replaces existing accommodation spread over a number of locations around Harrogate. Previously operating from a 1930’s headquarters building and four administration offices, the new building helps improve working efficiencies and provides a single location public services facility. The building steps up a sloping, underutilised council site within a sensitive wooded Conservation area on the edge of Harrogate town centre. The buildings’ three elements bring together public services, facilities for elected local councillors and flexible office space. Built over five stories, the design maximises internal daylight and natural ventilation with the majority of the building integrating intelligent ‘Cool-Phase’ units with manually opening windows and controlled louvred ventilation for managed occupant comfort. Pre-cast concrete floors and roof provide thermal mass whilst curved external walls are Structural Steel Framed with traditionally built local Yorkshire stone panels or curtain walling with profiled aluminium cladding. The curved roof is a radial zinc standing seam, except at low level, where a green roof sits under the tree canopy and at high level where a flat roof accommodates an extensive array of photovoltaic panels. Internally the council has had a cultural shift towards open plan working, inter-dispersed with third spaces. Moving from a traditional static working scenario, to a modern hot desking society, enabled us to reduce numbers significantly and consequently the building footprint. In addition we have give employees a number of alternative collaborative agile work spaces; with layout spaces, high bars, café seating, and soft seating areas. Employee well being has always been at the heart of the design with the aim to provide all employees with a visual connection to the green environment surrounding the building. A connection to natural daylight has motivated the emphasis to enhance the contact with nature. The new working ethos and office design is intended to both attract & retain staff, whilst providing spaces for the local community to utilise. Throughout the design Harrogate Borough Council were keen to involve the local community, as a result artwork across the building has been produced by local schools and the main entrance bike stand/ seat has been designed by a local competition winner. Overall creating a unified central hub has improved employee engagement and promoted a positive working environment in a contemporary, functional, vibrant space. A new £5m University of Leeds sports facility designed by Farrell & Clark was officially opened on Friday. The Brownlee Centre, chosen in honour of Olympic heroes Alistair and Jonny, sits alongside a new 1 mile (1.6km) cycle circuit – one of the longest in the country – at the University’s Bodington Playing Fields in north Leeds. The brothers officially launched the centre and cycle circuit on Friday 28th April. The facilities are open to sports enthusiasts of all ages and abilities. The circuit has a full programme of activity including “pay and pedal”, HSBC UK Breeze Rides for women and girls and special training sessions for elite athletes, University and local clubs. Bikes for children and adults are available to hire, along with hand cycles, trikes and tandems for use by riders with disabilities. It will also be the new home for the Leeds Triathlon Centre, where most of Britain’s Olympic triathletes train.. Some images of our recently completed extension and refurbishment for the Institute for Transport Studies at the University of Leeds. It was a tricky project within an existing structure. The building included a low headroom and multiple changes of level. Our Revit Model was integral to the project to coordinate servive locations to maximise headroom and omit ceilings. On Sunday members of the Leeds and London studios took part in the Royal British Legion Major Series at Bramham Park. 20 obstacles over a distance of 10K and lots of mud. An outstanding example of sustainable construction, the completed building incorporates highly sustainable building materials and techniques which place this building at the cutting edge of innovation within the construction sector resulting in the highest ever BREEAM “Outstanding” score for a University building at 95.2%. This ultra-efficient building delivers extremely low energy in-use costs and is an exemplar facility across the construction sector. 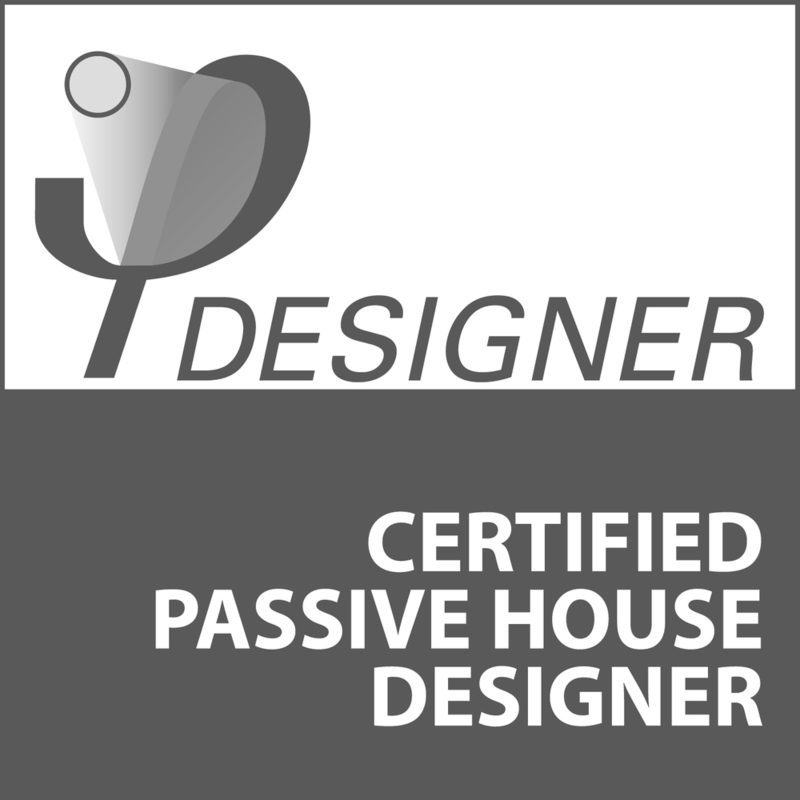 With total monitored energy consumption for the building at 30kWh/m2/annum and 50% of that total attributable to heating the building performs exceptionally well and is classified as a passive building. The energy in-use performance is approximately an 85% improvement over CIBSE TM46 good practice energy benchmarks.